Powerful and affordable Hotel Reservation System with built-in Channel Manager, Booking Engine and Payment Interface. Simplify your day-to-day operations with easy front desk tools, full back office reporting and guest management. Guest tracking and automated customized confirmations. Maximize revenue and increase occupancy with automatic, synchronized rate changes from your front desk to all online channels. Automate rates based on key factors like occupancy, date range and competitor rates. Manage multiple online connections with complete control over rate and availability allocations, automatic booking import and synchronized availability updates to all channels. Designed with the flexibility to grow with your business. Customize your PMS to fit your property with Interfaces and Modules – PCI Compliant Payment Gateway, Yield Management, POS and Guest Services and more. Best of all, MyPMS is packed with features! 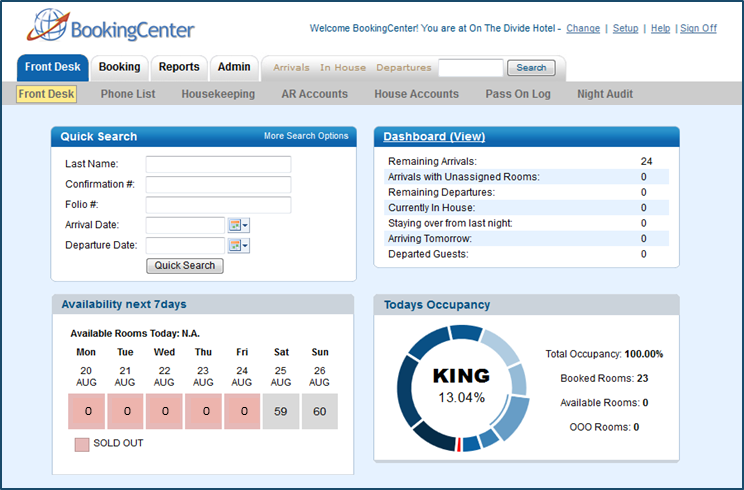 Front Desk Dashboard with Daily Snapshot of key data such as, occupancy, availability and new bookings. Group Booking management with multiple folios and availability allocation. Multiple House Accounts for front desk charges and extras. Post notes to front desk staff with the an interactive messaging system. Simplified Night Audit for daily audit of all transactions and booking activity for the day. 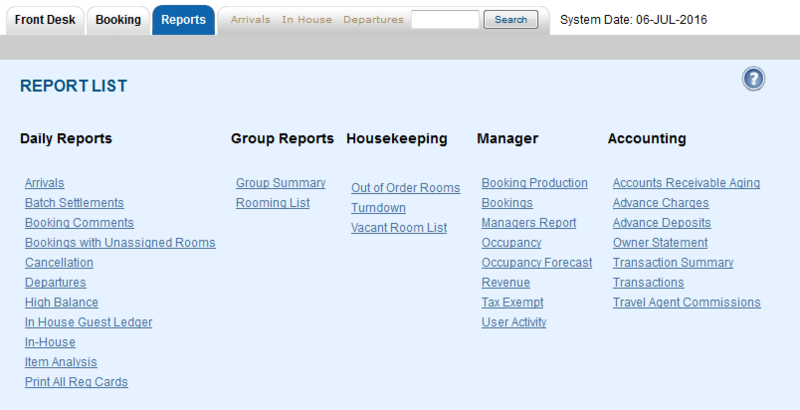 Daily Reports for housekeeping, arrivals, booking comments and in-house guests. Create detailed Housekeeping Lists, easily mark rooms clean or dirty. Easy Guest search, check-in and check-out with quick search tools. Quick lists and Daily Reports of Arrivals, Departures, In House, Cancellations and more. 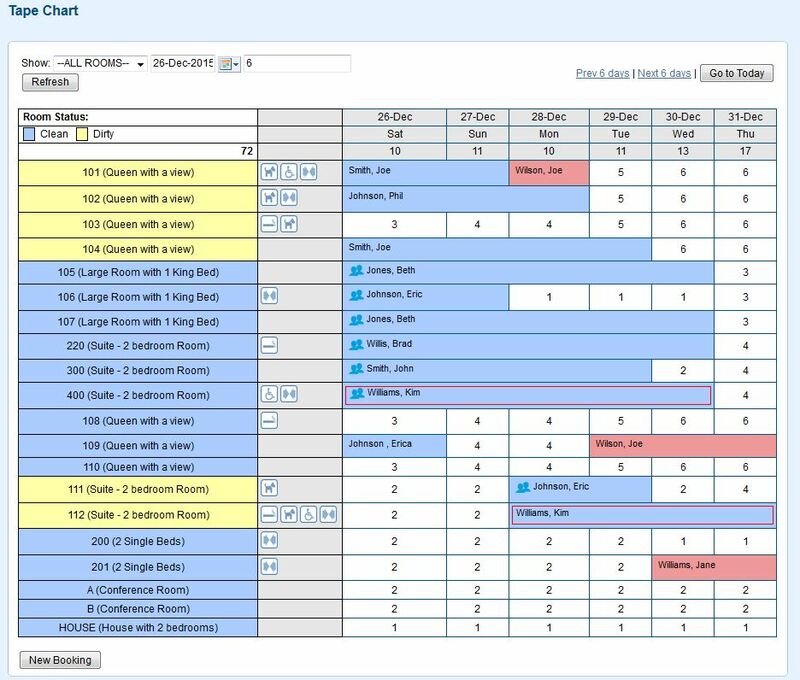 Create and manage bookings with our Interactive Tape Chart and availability allocation features. Assign Color Icons to Group Bookings for easy identification on the Tape Chart. Flag a booking based on a Guest type to make guest bookings easy to see on the Tape Chart. Easily modify booking dates and room assignments. Easy control of daily, weekly, seasonal, promotional and discounted rates (AAA, Corporate, etc.). Combine with Packages and POS items. Manage pricing and availability with allocation to specific channels. Automatic synch with booking engine, GDS and OTA Channels. Automated Rate Management tools already built in your PMS system. Easily make changes to multiple rates at one time with the recent enhancements to Manage Rates and automate rate changes with Yield Management. In addition, Booking.com/ BookingSuite customers can now integrate Rate Intelligence/Rate Manager Tools. Powerful and flexible folio tools for applying charges and payments to a Guest bill. All Charges and Payments will appear in the Guest’s Primary Folio and stayed attached to the Guest Booking. The functions available in the Folio allow you to create additional folios, transfer items between folios and email or print folios. These can be used as a Guest Receipt or you can create a customized Receipt Letter. Apply Advanced Deposits and payments with detailed tracking. Email and print customized receipts and folio statements. Create and use multiple payment methods including Credit Card payments and more. Our Direct Bill Management and AR Accounts give you the ability to handle corporate accounts with detailed tracking, statements and Aging Reports. 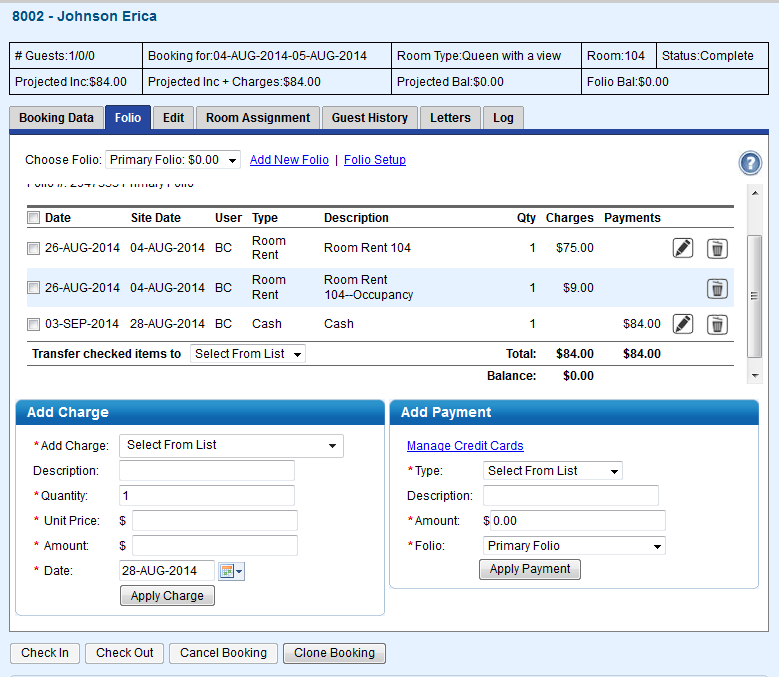 Easy Group Booking creation with Room Type and Room Allocations for availability blocking. Use Master and Individual Folio Management to charge to the group or individual bookings and easily transfer charges and payments. Create customized Confirmation Letters and Receipts with our custom letter editor. Take direct website bookings for Groups with the Group Booking Engine. This online booking engine is a central location for individuals to book a room as part of a Group Reservation. Let guests choose their own room types and enter payment information from from the ‘real-time’ rates and availability. Secure guest access with User ID and Password with customized logo, banner and Room Type images. Display Deposit, Confirmation, and Cancellation Policies. Learn more about the Group Booking Engine. Offer specials, promotions and packages online. Package rooms and extras for specific dates. Set length of stay, discounts, number of guests with fixed or dynamic rate pricing. Build your own custom package with complete control over the rooms, items, pricing, dates, and minimum stay requirements. Combine a room, flowers, and a bottle of wine, etc… and sell it from your website with a two night minimum, available any day of the week. Manager and Accounting functions with Revenue, Item Analysis, Booking Production and Occupancy Forecasting. Full range of automated report and marketing tools. Run Reports with advanced search criteria. Get extensive Guest History with export to csv., html and xls. Advanced Guest Search give you the ability to find guest information easily. Create lists based on specific criteria for analysis and marketing. Print and email customized guest letters for registration, confirmation, receipt, cancellation and more. Merge fields auto populate guest and booking information. Send automated “pre” and “post” stay emails based on check-in and check-out. MyCard Credit Card Gateway gives you full control. Use your existing Merchant Account (or, we’ll help you get a new one that saves you money) to allow ‘swiped rates’ on all credit card activity. Completely integrated with your PMS system. Automate authorizations (auth, increment, and void), Make Payments, Give Refund, Create Batch settlements. A great way to make sure the card holder has the appropriate funds on a credit card to pay for their stay. Swipe (or manually key) any credit card to a Booking, Group Booking, House Account, or Direct Bill payment. Ability to authorize, increment an authorization UP or DOWN (ie, add or remove to an auth), or void an auth to give money back to the card holder. Batch settle from within MyPMS as a built-in part of Night Audit. Search by credit card number to assist with finding booking using specific cards. Charge Back templates to make responding to a charge back easy and automatic. As a Channel Manager, we seamlessly connect your property management system to your website and to Global Distribution Services (GDS) and OTA programs while managing rates and availability in real-time. Accept bookings from over 100,000 popular consumer travel websites including Expedia, Travelocity, Orbitz, Priceline, Booking.com and Orbitz . Learn more about our GDS and OTA Services. Add GDS Distribution – Complete, 2-way GDS (Sabre, Galileo, Amadeus, WorldSpan), Pegasus, and GenaRes integration to thousands of OTA channels. Website Booking Engine Take online bookings with ‘real-time’ rates and availability (optional payment processor). Customize “look and feel”. Sell items and Packages. Yield Management Manage rate yield and forecasting. Automate changes to Front Desk, Website, and GDS/ OTA Channels. TripAdvisor – TripConnect Our seamless interface to TripAdvisor, Trip Connect and Review Express is highly effective at helping travelers choose your property when booking. Marketing Services (MSO) Use guest traffic patterns increase revenue sources. Better understand your marketplace and maximize your impact! Owner Management Allows management of accounts per OWNER and percentage (%) of the revenue allocated to from bookings per unit. Packages Add items to accommodations and sell these packages online. Integrate tracking for easy fulfillment, financial and daily management. Unlimited Rooms for one, flat, low monthly fee.